If any readers woke up yesterday, still expecting to celebrate the exiting of the UK from the EU this evening, we would be surprised. Everyone we know was expecting the can to be kicked further down the road. It was. One of the many remarkable things about the British is our ability to absorb enormous amounts of frustration, and yet still to keep calm. If this sort of fiasco had been experienced by the peoples of many EU27 countries, we suspect that the consequent street riots would make the three months of Gilets Jaunes protests in Paris and other French cities look like a picnic on the banks of the Seine. When will the gasket blow? Despite the British people’s reputation for calm, we wonder how long it will be before matters become more heated. We have already seen increasing calls for action by ordinary people. Some suggestions have been illegal, others have been inventive and perfectly lawful. The Brexit Facts4EU.Org team cannot of course endorse any action which is - or borders on being - illegal. Indeed we believe that any such action might only hurt the Brexit cause. It can also be argued that legal forms of protest which inconvenience other people would be detrimental. For example, the suggestion that people fill trolleys in supermarkets and then just abandon them, or that millions of people go for a totally unnecessary drive during rush hour. These actions might conceivably make the news, but they will hardly endear Brexit to the people inconvenienced by them. Who do we want to wake up? Putting aside the EU - and believe us we wish we could - it is MPs who are at the heart of this mess. Be they ministers or backbenchers, the majority of them are culpable. They are the ones who should be ‘inconvenienced’. If we want Brexit, we have to stop these MPs from acting anti-democratically. Imagine if we were to produce a list of MPs who have effectively thwarted Brexit? This would be a very long list. In fact it would be easier to publish a list of MPs who have been sound on delivering the result of the Referendum, rather than those who have voted to wreck it. The sound ones would now comprise a very short list. We have a spreadsheet. It’s a massive spreadsheet. It has every MP’s name on there, how they voted on each key motion, how their constituency voted in the Referendum, etc. How would you divide up the MPs? 1. The first category is relatively easy – Rock-solid Brexiteers who would rather put up with Guy Verhofstadt as a lodger than vote for Mrs May’s surrender treaty. In this category would be people like Sir John Redwood, Owen Paterson, Steve Baker, Anne Marie Morris, Andrea Jenkyns, David Jones, Kate Hoey, Graham Stringer, Sir William Cash, and others. 2. Then it starts to get more difficult - maybe we could call them 'Wet Brexiteers'. There is a range of MPs whose heart might be in the right place, but who nevertheless caved in because they felt Brexit would be lost. This list includes people like Jacob Rees-Mogg. 3. Then we get to a Real Mixed Bag – the MPs who sometimes voted for this, sometimes for that, and who leave us wondering what on earth they truly believe in. Many could be persuaded to do what's right. 4. The fourth category might be called Central Remainers – MPs who campaigned and voted for Remain, and who want to stop Brexit but are too dishonest to come out and say so. These may be vulnerable to persuasion - especially those from Leave-voting constituencies. In this final category are people like Kenneth Clarke, Dominic Grieve, Anna Soubry, Amber Rudd, Sarah Wollaston, Yvette Cooper, Sir Oliver Letwin, Sir Keir Starmer, Sir Vince Cable, Tom Brake, Caroline Lucas, Liz Saville-Roberts, and the entire SNP. Regular readers will be bored of our exhortations on this subject by now. We continue to believe that the major problem is a 75% Remainer House of Commons versus democracy and the result of the Referendum. In shorthand: ‘MPs versus the People’. We also believe that the one thing which can grab the attention of MPs is the prospect of losing their jobs. We will write more on this over the weekend. We welcome your thoughts, dear reader. Would you like us to attempt to produce a list of MPs in categories of ‘Remoanerishness’? Would you like us to produce a new campaign, or would you simply prefer that we focus on research and publishing facts about the UK’s membership of the EU? Or a combination? Please bear in mind that we are massively underfunded and can't do all we would wish to do. Please also bear in mind that we have many thousands of readers, most of whom use our contact form rather than posting comments. Let us know below or by using our contact form. The lunacy continues: "Education Minister: Parents Can’t Veto LGBT Lessons for Children"
"We welcome your thoughts, dear reader. Would you like us to attempt to produce a list of MPs in categories of ‘Remoanerishness’?" Just before the next election 3 weeks or so before a bombshell list of remoanians could be a good idea for wide dispersion. On the other hand not all of them have been rabid and nasty about their remoanerism. On balance it probably could backfire because of that fact. For the time being until the 'next farsical leaving date is close' I would say I would vote for you to "focus on research and publishing facts about the UK’s membership of the EU?". Like for example it was said today in the Daily Express that after spending £4bn already this Government STOPS no deal planning. It would be excellent to see a breakdown of those costs! In my Brexit head my Arya list begins with those Ultra Remainers I would like to see the politically eliminated: Grieve, Soubry, Cooper, Cable, Blackford, Lucas. What they all have in common is the mind set of the status quo. Remaining in the EU keeps jobs. It doesn't occur to them that leaving the EU will CREATE jobs. Target them with the challenge: prove your opinions with FACTS and sources which Facts4eu will publish. 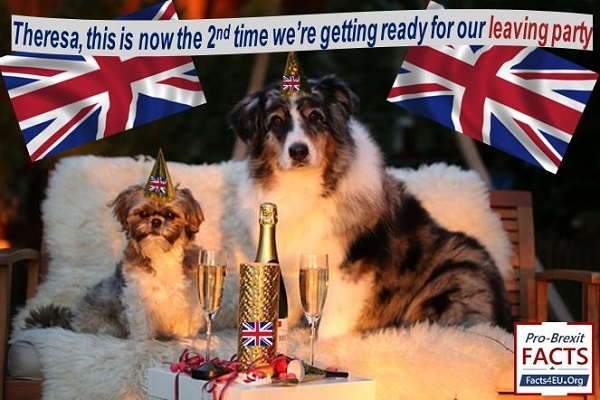 Convince us to Remain! "Convince us to Remain!" - I have yet to hear one valid reason from anyone why we should remain in the EU! Not one single valid reason. "What are the tangible benefits of remaining in the EU?" With senior Shitehall mandarins finally dropping their mask & ceasing, with immediate effect, all plans for a WTO exit, most of the traitors to this country are now out in the open. The EU MPs think that it's job done, as was planned, and b*ggered off for a long holiday. The traitors to democracy are already squealing that people aren't reacting kindly to their treason & need 'protection'. As ever, we need the democracy supporting people to join together, & put their vested interests to one side, to fight the evil (the only way to describe it) of the anti-democratic establishment. Their numbers are small but they are in positions to pull the levers of power. The people will support them. We have no interest in their posturing or political games, just for plain leaving the EU. I would like to see the pro-leave groups & MPs come together for an urgent class action, in addition to Robin Tilbrook's case. There is now even more evidence of May, Govt & Parliament breaking Constitutional conventions and acting unlawfully and against democracy. If the 17.4m plus democracy supporting remain voters donated a minimum of £1 to a crowdfund to support this, it would be a worthy cause for many. If the leave supporting campaigns could get behind such an idea, we might get justice. The EU thinks that it has won, & the plan has worked perfectly with their EU agents in place. To all our democracy loving counterparts in other EU 'states' get out of this EUSSR whilst you can. I left the EU on 29th March. Did you? Facts4eu.org Thank you for all your ongoing hard work and campaigning, from all of us that voted to leave the EU. If we supposed to live in a democracy, please could you expose and concentrate on the house of Lords and MP's who have vested interests in remaining in the EU. How can they legally vote on Brexit decisions when it's in their own financial interest to remain in the EU, Mandelson, Hessletine et al. It's like a family member being on trial and all his family being on the jury, it's so wrong and needs challenging. Well nobody in the UK can believe that we live in a democratic country anymore.That illusion has been destroyed by the duplicity of our so called elected elite.What can we the electorate,taxpayers do about it? Well I for one will never vote Lib/Lab/Con in any election again,If there is no candidate available I shall record spoilt ballot.I shall challenge my MP at meetings,local press on every occasion I can.He has after all voted three times to impose vassalage on me.May's Withdrawal Agreement is worse than the deal the French imposed on the Germans after WW1,and history shows how that ended 14years later! There has been a lot of hot air spouted in Parliament about "far right"parties,believe me the actions of MPs over their failure to leave the EU, and upholding the democratic vote of the people will spawn more "far right" parties than ever before. You do a great job on publishing facts. This enables us all to be aware and make the arguments too. Too, your campaigns help to explain how best to get our voice heard in numbers. These have been mostly 'writing' campaigns. Different campaigns are needed for different people, and perhaps different methods. There needs to be creativity, flexibility to a rapidly changing situation, and specific targeting of the principal players. You have done a very good job with the resources you have. Please continue. I note your comments on legal direct action above (both suggestions of mine). There is a place for this, but I agree that inconveniencing people unnecessarily can backfire on the cause. Such protest is far better if specifically targeted. That means targeting specific players such as only undertaking it in Arch-Remainer MPs seats, combined with de-selection and voting out their party in those seats. Or targeting the other EU27 countries, causing them enough trouble so they want us to leave - which might include writing protest letters to their leaders; burning EU flags in your town outside the 'welcome',sign, putting it on youtube, and sending it off to activists in your twinned EU town, encouraging them to do the same; or by boycott of products and businesses of these EU27 (so you might want to protest at Lidl, abandon full trolleys, or leaflet their customers to avoid), and by not visiting those countries, denying them tourist monies, and not using their airlines. I posted this yesterday:HIT THEM WHERE IT HURTS! STOP BUYING EU STUFF! Good Luck, and Thank You for all your efforts - you do a great job.